UCRISE aims to conduct innovative, internationally relevant, high quality, focused sport and exercise medicine research. Theme leader, Professor Gordon Waddington is currently undertaking a two year conjoint position with the Australian Institute of Sport as a 0.5FTE Professor of Sports Medicine, working principally across the Departments of Sports Medicine and Physical Therapies. Projects that are part of this collaborative effort include: the UTC Reliability Study, the Rio 2016 "Stay Healthy" project and the UC-AIS AMEDA proprioception and stability assessment platform commercialization project. Stephan Praet, an AIS UCRISE Adjunct Professor, leads a novel imaging modalities project aiming to map pain perception with matrix abnormalities for the evaluation and treatment of Achilles tendinopathy in a project involving AIS and UCRISE researchers. High performance occupational health has seen the development of new research links between UCRISE and the Australian Defence Force, in the context of the combatant being an "athlete" with specific physical and cognitive requirements often being tested under extremely challenging conditions. Jeremy Witchalls and Phil Newman lead a large scale project examining injury predictors in the Australian Defence Force recruits. Another emerging area has been the "athletic heart" with an international collaboration now underway examining the effects of exercise on cardiac structure and function. A sports cardiology imaging focused project supporting up to three PhD programs is being developed in 2016 with Stuart Semple the UCRISE lead researcher. The aim is to establish an internationally recognised Cardiovascular Physiology Research Group combining researchers from UCRISE, AIS, Baker IDI (Melbourne), ASPETAR Orthopaedic and Sports Medicine Hospital (Qatar) and Liverpool John Moores University (UK). In the field of exercise as an adjunct therapy, led by Kate Pumpa, mechanisms for controlling weight gain in women with early stage breast cancer are being evaluated. UCRISE is also a coordinating site in the ACT for the "Exercise during Chemotherapy for Ovarian Cancer (ECHO)" project. The effectiveness of exercise on aging, body composition and balance in older persons and Parkinson's disease is also being investigated along with mechanisms for improving child and adolescent balance development. 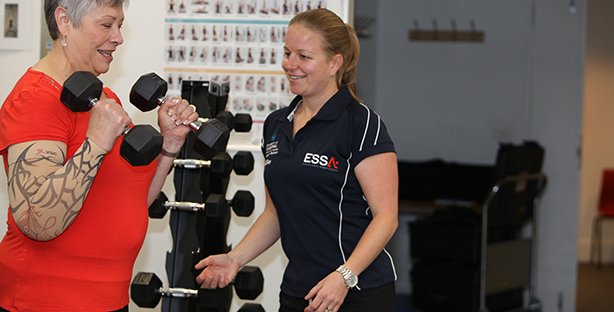 Currently researchers in sport and exercise medicine are also involved in a number of external collaborative projects including; Ballet proprioception with the Australian Ballet School and the Wingate Institute (Israel), Snow Sports Concussion with the Olympic Winter Sport Institute of Australia, and Adolescent development and proprioception with ASPETAR Orthopaedic and Sports Medicine Centre, (Qatar). Lisa Elkington; Examining novel mechanisms for evaluating concussion and changes to proprioception. Andrew Flood; Investigating pain modulation and athlete performance. Kylie Holt; Mapping high performance swimmers' shoulder overuse injury. Andrea Miller; Dynamics of Water Polo players shoulder proprioceptive function and injury prevention. Phil Newman; Evaluating aspects of diagnosis and therapy in Medial Tibial Stress Syndrome. Sam Pomroy; Evaluating effectiveness of treatment measures in recovery from hamstring injury. Mark Stokes; Dynamics of Hockey Players lower limb proprioceptive function and hamstrings injury.